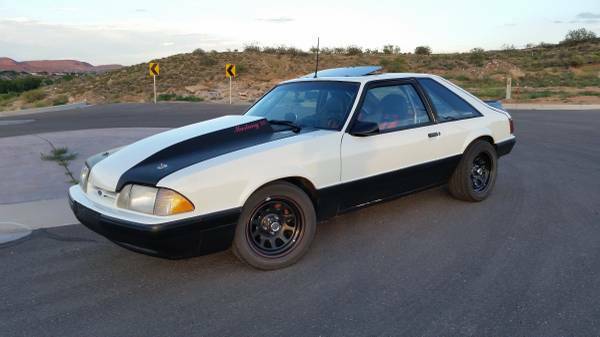 Well obviously I am new to the forum, and I just wanted some advice on whether or not this mustang would be a good deal. it's an 87 and has been stripped, full roll cage, 20 gal gas tank in the back, 302, headers, cam, exhaust, full suspension, t5 trans, racing steering wheel, bigger radiator, push button start and toggles for the fuel pump and battery, custom aluminum dash, gauges work but gas gauge needs adjusting, engine has 5,900 miles on it apparently (idk about that), paint has seen better days, wheels are okay, yokohoma tires, racing seats, 5 point harnesses, frame seems to be straight, clutch might be going out, it did fine until i tried to put it into reverse, it would grind and didnt want to go into gear even with the clutch all the way in. (anyone know what that might be?) it seems like a pretty solid car. Putting a price on a car without knowing the exact details of the mods done to the motor and car is hard to do. We'd need to know exact spec's of engine mods, example: what cam, heads, intake, etc. Does he have any receipts for any parts or work done ? Was it converted to Mass Air ? Just to many variables to give an accurate guess . It sounds like PO converted this into a track car, which if done right, they stuck alot of money into it suspension wise. Can you give any details on that ? And as for the grinding in reverse, that's actually normal. The trick is to put it into 5th gear before shifting into reverse. Too far from stock for my preferences. The owner didn't seem too knowledgeable about the mods, k&n intake, the cam wasn't that extreme at all, I own a 2005 gto with a much bigger cam, so to me it sounded like a stage 1 cam? just for that little bit more power. he doesn't have any receipts but from my eye and ear it seems like the build was done well, suspension is a full coil over set up (i looked but couldn't find the brand) motor, trans, and clutch behave very well, brakes are above average, steering is tight, only one little rattle in the back and it doesn't sound too bad. its still a little rough but what kind of money would you spend on a car like that? he's asking a very low amount to me but I'm not sure how good the price is. Still a tough call to throw out a ballpark estimate, but if it's done right, body is straight and not rusted or tweaked, and it's a good solid driver like you say, maybe 3k - 4k being it's pretty much a devoted track car. But maybe more, maybe less.........lol. What are your plans with it ? Race or street ? It could be a very fun car.......and that's all that matters. Quick Reply: HELP.. Should I buy this fox?